After a lovely cup of coffee this morning, I headed to the downtown Saturday Market for some of summer's bounty. Inspired (really re-inspired) by the great Julia Child, I fancied myself strolling the markets of Paris, looking for the perfect ingredients while sharing clever conversation with the locals. Okay, well, sort of. Lots of folks were shopping this morning, young families pushing strollers as well as older couples holding hands and looking over all the beautiful offerings. The scents of coffee and pastries and sizzling sausages were in the air, too. I made a beeline for the fresh flowers, where I bought two bunches of sunflowers. The purveyor told me that they typically lasted about two and a half weeks, which makes the $5 price seem like a bargain. Next, I got in line for the peaches, by far the most popular item this week. 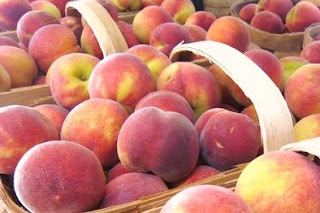 I bought a half peck of peaches and a pint of blackberries, and already I regret not buying a quart of those jewels. I'd estimate we've eaten at least two bushels of peaches this summer, and they have all been delicious. Most have been eaten out-of-hand or chopped up on cereal, but we have had a couple of cobblers and one batch of peachy salsa. After peaches, I headed for vegetables, where I was in the market for tomatoes. I bought a few "regular" tomatoes, and then several heirloom varieties, too. The farmer/seller recommended the Purple Cherokee as a great tomato sandwich tomato, so I will be trying that for lunch tomorrow. Tomorrow evening our dear friends C & T are coming over, and I'm planning a tomato tart, blackberry, pecan, & bleu cheese salad, and peach cobbler for dessert. Needless to say, the sunflowers will be the floral centerpiece--I am hopeful of making a "Paul and Julia Child" type dinner party, which looked so fun in Julie and Julia. Speaking of which, I did enjoy the movie so much. I had read My Life in France several years ago, and I loved it. I am ashamed to say I haven't tried anything from Mastering the Art of French Cooking, but someday, perhaps. It isn't so much about the cooking for me, as it is about the willingness to share, to be so generous, and to try something new at--let's face it--what's rather late in life. Meryl Streep is amazing as are the sets and the wardrobe and the cinematography. I also loved how marriage shined in this movie! Each spouse supportive and accountable to each other. Truly refreshing to see on the big screen!